Deputy Commissioner of Kullu, Sh. Rakesh Kanwar with an innovative idea gave “Kullu Lalhri” a new avatar during Dussehra 2014. People from all over the district were invited to perform traditional “Lalhri Naati” during Dussehra. A group of 8540 men and women took part in this dance in the Rath ground. The title of dance was ‘Pride of Kullu’ based on the theme ‘Beti hai Anmol’. On bright day of 7th October 2014, group of ladies from different villages attired in black/white pattu and red/blue dhatu started assembling in Kala Kendra.The male dancers were also present wearing traditional chola, topa and kalagi. In blink of an eye, the open air Lal Chand Prarthi Kala Kendra was packed with people dressed in traditional costumes and jewellery. At 1:00 PM, a patron of Himachali culture, Chief Minister of Himachal Pradesh, Sh. Virbhadra Singh arrived at the Kala Kendra. After addressing the people, Sh. Virbhadra Singh signalled them to the move towards Rath ground. In line of three, all the dancers proceeded to Rath ground on the beats of dhols/nagaras. 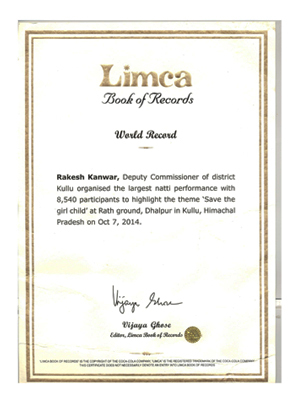 The historic dance entered the Limca Book of World Records. The same event was repeated in Dussehra 2015 with an attempt to get it registered in Guinness World Records. Preparations were made as per the directions issued by the Guinness authorities. On 26th October, 2015 during during International Kullu Dussehra, 9,892 women and men danced on the beats of traditional Kulluvi beats. 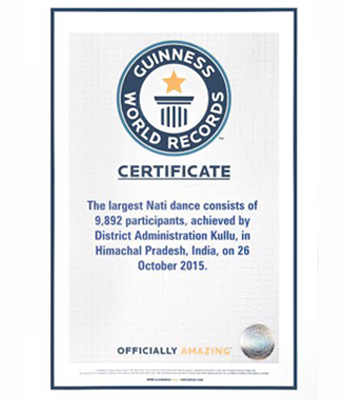 The dance got registered in the category of “Largest Nati Dance” in Guinness World Records. It was a proud moment for not just people of Kullu but the entire State of Himachal Pradesh.